Available March 2018. Pre-Order Available. We found that our upgrades to the factory 370z fuel pump could take us to around 700whp on E85. In our quest to run 9's with a full weight manual transmission street car, we wanted more power to ensure success. The next step in fueling was to construct a twin fuel pump that could raise the ceiling much higher. Our solution was a simple drop-in replacement for the factory fuel pump housing that is compatible with any return fuel system that includes an inline fuel filter. 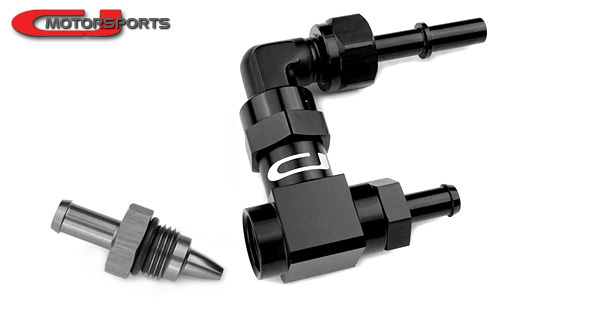 Our own billet venturi jet pump is included with the necessary adapter to plug in the original in-tank siphon hose. The fuel level gauge will still work properly, as we have integrated a mount to attach your original fuel level sensor. The billet top hat has an integrated fuel output manifold. There are 6AN o-ring ports at either end of the manifold. It is drilled through so you can use either side output, or you can use both outputs for extreme applications. The return port is also 6an o-ring. We include 5 fittings for the top; a 6AN adapter for each of the 3 ports, a 6AN plug for single output use, and a QD adapter for the stock fuel feed line (we usually use it as the return line). The included CJM billet venturi pump assembly takes over the business of transferring fuel across the saddle-bag style fuel tank. Our jet pump is specially tuned to function on the pressure side of the fuel system, rather than the return side. This creates a stronger and more reliable venturi action. This also means you wont have to mess around with idle pressure spikes or adjusting jet orifice sizing. Under normal cruise conditions, the jet pump will recover fuel from the left side of the tank at a rate of 60-85LPH. Under high boost and fuel pressure, the recovery rate increases to 100-120LPH, while expending just 28LPH @ 73.5psi. The fuel pump installation kit option provides a pair of fuel pump strainers and the appropriate size PTFE hoses with clamps for installing your pumps to the twin pump unit. Choosing one of these options is necessary unless you already have your own in-tank plumbing supplies. The Holley HydraMat can be added to one or both of the pumps when fuel slosh starvation is a concern. This fuel pump strainer can still collect fuel while only part of it is submerged. Its extended length can reach all the way to the back of the fuel tank. Fuel Pump Installation Kit: These kits include PTFE hoses, clamps, and fuel pump strainers for integrating your pumps to the twin fuel pump unit. These kits are required for setup unless you already have these supplies or your own source for them. Twin 5/16": Aeromotive 340, Walbro 255, and many other common in-tank pumps of ~39mm O.D. require a 5/16" hose. Twin 3/8": Walbro 450 pumps have a 3/8" output, and will require this option for running twin 450s. 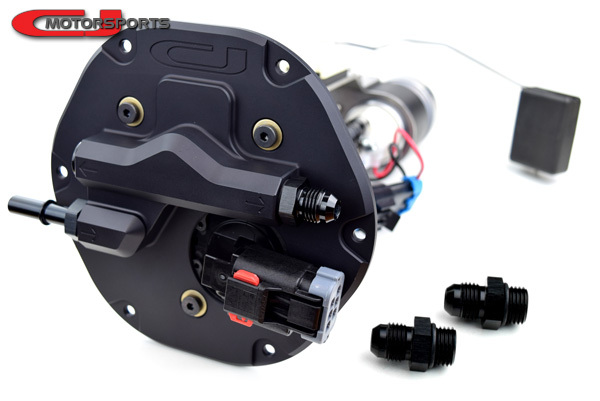 5/16" & 3/8": This option will allow you to install a mismatched combo, such as one Aeromotive and one Walbro 450. Include Fuel Pumps: Select a fuel pump or two if required. HydraMat Upgrade: This option will replace one or both fuel pump strainers with a Holley HydraMat. These are special over-sized fuel pump pickup strainers that are able to draw fuel even when partially uncovered. These can drastically reduce or eliminate fuel slosh starvation without the need for adding baffles. To use a single HydraMat on the primary fuel pump will usually be sufficient since most drivers will not be under full power, requiring both pumps, while simultaneously turning at high speed. For extreme applications, a HydraMat on each pump will help ensure fuel pickup remains reliable. 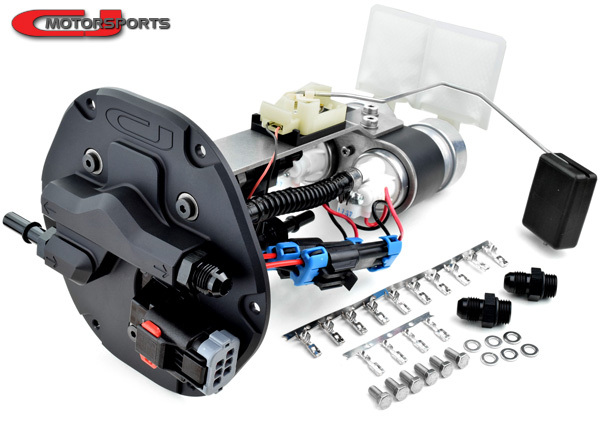 Return Fuel System: This twin pump requires your 370z to have a return fuel system with external filter installed. 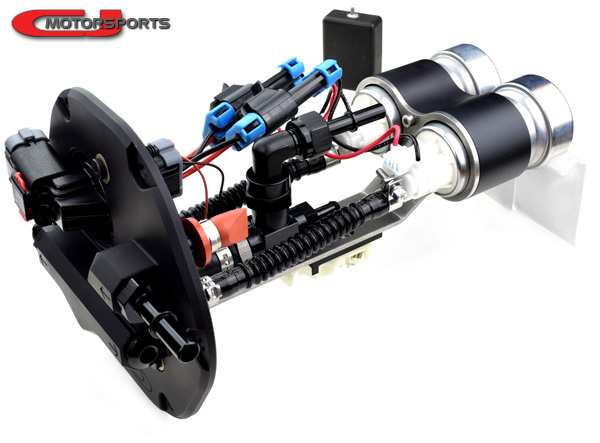 Choose from our available return fuel systems to compliment the twin pump. Fuel Pump Relay Kit: High performance fuel pumps put a greater load on the wiring, and the small factory wires can not only get very hot to the touch, but they can prevent your new pumps from performing at their best. Install a relay kit for each pump to upgrade the fuel pump wiring. Fuel Injectors: Complete the package with a set of fuel injectors. We recommend 1050cc injectors for all boosted VHR applications under 700whp. Intended for 2009 - 2018 Nissan 370z. This product does not fit Infiniti G37 or Q60. Return fuel system with external fuel filter is required. Factory fuel pump wiring connector is removed and upgraded with a provided one. Wiring and crimping experience and related wiring tools are necessary for installation. It is highly recommend to stage the fuel pumps. This means that only one fuel pump is running full time. The second fuel pump should be activated when the engine begins making boost.